Technology has made life so easy this day that one can sit in the comfort of his and make really good money online doing little or even nothing. You may be wondering right now, "How on earth can one make money without doing work?" I will shock you to say that it is possible to make money online without any much input from you. That is the focus of this web page. And I call it Making Money with your Computer Idle Processing Power. So, what is this computer idle processing power all about? Whenever you power on your system to run any task on the internet, the processing power has the ability to make you money with the new system of making money online called EarnMoney. What is EarnMoney all about? The EarnMoney is a software you download, install in an internet connected laptop or desktop computer that meets the minimum specifications of the software. Once the software is installed in your computer, whenever you are connected to the internet you can launch the software to use your computer idle processing power to perform tasks on the central server of the EarnMoney Platform. The type of tasks your computer processor will be performing is not publicly disclosed to the general public by the EarnMoney team, of course, that's their business secret. According to them, they cannot give specific details of the tasks because they work in a competitive space and want to their edge. Also, over time their approach and methods may change, like every other good business, they are open to pivoting as the workplace evolves and are robust enough to work with. The only information they disclosed to the general public is that they utilize machine spare resources to process work payloads and that is where they make their money, in which each work payload determines the outputted money earned. 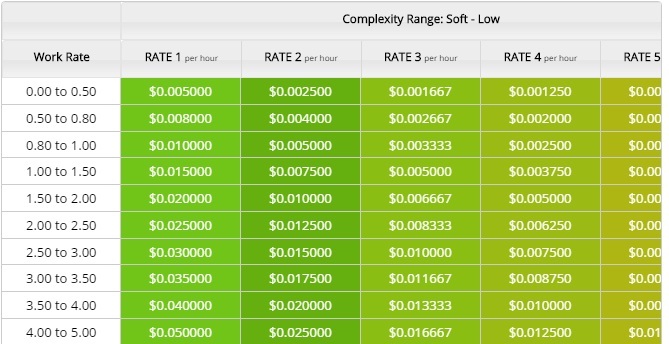 Now that we've had an introduction to how the EarnMoney software can help you make money with your idle computer processing power, let's go further and learn how much and what are the different ways you can increase your earning power with the platform. How Much Can You Make from the EarnMoney Software? The speed of your computer processing power which are determined by the size of the RAM, the processor and the age of the computer (i.e. whether your system is new or old. Of course a new system will perform far better than an old one). The higher the size of your system RAM, the better. As a matter of fact, you may not be able to install the software if your RAM is less than 2GB. And for better performance, your processor should be quad-core and up to 2GHz in speed. Another thing that can affect your earning power is the number of computers you installed the software and have them connected to the internet. There is no limit to the number of computers you can install the software, the more computer you have it installed and connected, the more your earnings. Another thing that determines how much you make is the speed at which you run the software. The software comes with five (5) different speeds which are the crawl, slower, normal, faster and supersonic speeds. Whichever speed you chose will determine your earnings. And be aware that when choosing your speed you should consider the strength of your computer, can it handle the speed you are running at? The third factor that can affect your earnings is your internet connection. You need a powerful broadband internet connection to make good money with the software. While earning with the software is passive and does not require any much input from the user, there are additional ways one can speed up his or her earnings. such as referring others through their affiliate program, sharing your links for others to click and you get rewarded with 0.25 cents for each valid click, participating in paid survey, writing contents for agencies, sharing links on social media, sharing videos, translation services, web surfing, products reviews, and becoming a virtual assistant all via the EarnMoney platform. 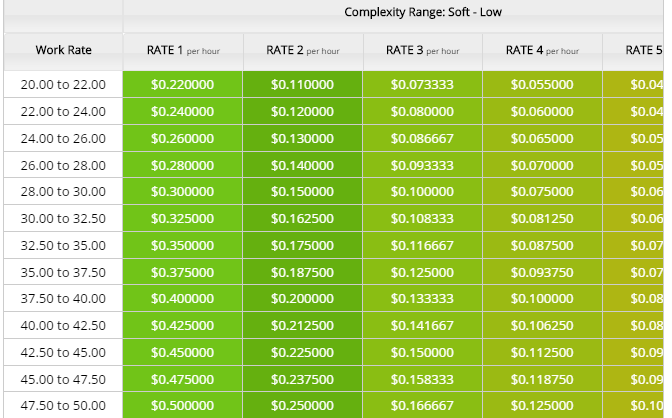 Let's consider the following earning tables to have an idea of how much you can make from the EarnMoney platform. The earning rate changes from time to time, particularly every 1 minute, and there is no set price for any particular user on the platform. Each individual's earnings are dependent on four key factors as shown on the image below. According to them, the tables below are just predictive and are subject to change at any time. They are just indicative of the expected top earning ability depending on the factors depicted in the image above. There is a different table for each workload per second. Average users on the EarnMoney platform are running at this work rate. As you may know, most computers made these days are of high specifications, unless the user is using an old computer. Most new computers these days come with about 4GB of RAM and quad-core process of high speed. If you have such computer your earning will be very high in a short period of time. The rate indicated from highest to the lowest workload where rate 1 indicates the highest workload. Once you install the software you will see more rates that are not captured in this image. Your rate per time depends on your computer performance and the speed at which you set the software. Although this is still considered low-end in terms of computer ability, you can still earn really solid passive income from your system working at this rate. Check the examples in the table below. On the EarnMoney platform, anything below 10 workloads per seconds is considered to be low-end. If your system is working at this rate, it will take you a very long time to reach payment threshold unless you promote your affiliate links to your friends and family and probably engage in other earning platforms on the EarnMoney system. Let's look at the earning table to have an idea of how much you can earn working at this rate. How Can You Receive Your Earnings and How Often? EarnMoney platform has about 8 means of paying you for your work. They can pay via PayPal, Payoneer, Venmo, PayZa, 7connect, Western Union, Bitcoin, Monero and Wire Transfer. You get paid once your balance is up to the minimum payment threshold of $2.50 for work balance and $50 for main balance. You don't have to wait until your main balance reaches the threshold. Once your work balance is up to $2.50, you can withdraw that right away and wait for your main balance to reach the threshold. If you have a very good system, reaching the threshold wouldn't be a problem. You can reach it in a matter of one day, depending on the speed you are working at. So, what are you still waiting for if you can use your computer idle processing power to earn little side income on the internet while you focus on the things that matter to you. If you are working in an office, you can run this software while you focus on the office work. Before you close from your work, you must have made some side income. Passive income is very good, you know! 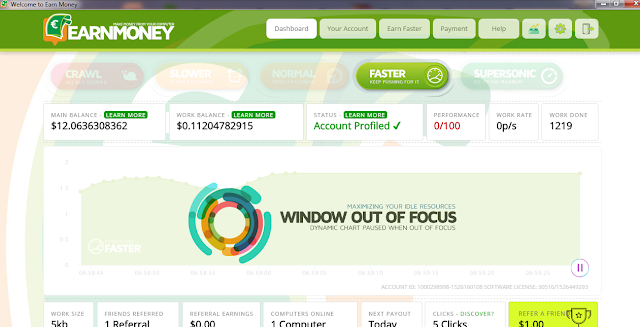 So download EarnMoney, install it in your system, power it on and start making money right away.